Thank you for this lovely alphabet, have enjoyed collecting it. Please, please vote for 'U"!! Just one left! Wonderful, thank you so much for such a lovely set. Such a great alphabet. Thank you. Thank you for such a wonderful alphabet!!! Thanks ! got all but 1 !! Thanking you in Kindness for this Easter Font that has come to an End!!! Thank you so much for this very cute Easter font. I missed the Bunny embossed F and would appreciate any votes for this letter. Thank you! For all of you voting for Firebird letters higher than Q, if you vote with those of us wanting the rest of the alphabet, we will be able to get all of them within a week or so. We need your help from the looks of it. Thanks for reconsidering your vote. I somehow missed the S in this font. please vote. Vote for the U please! Please help me vote for the E. Thank you. Thank you so much everyone for getting us all this really cute alphabet. 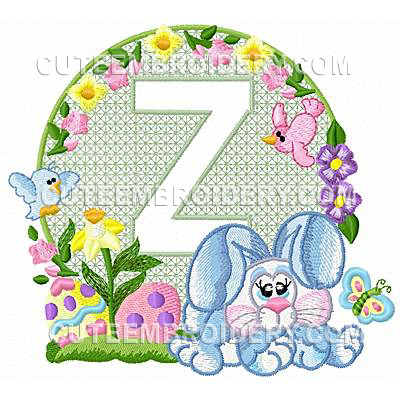 Now I would like to ask everyone to help us finish up the Firebird alphabet that we had started just before this bunny alphabet. We need to start with Q. All help will be much appreciated. Merci pour ces bien jolies lettres !!! Thanx for this whole Beautiful Font!!! Easter for Sure!! !